Brian Buffini, an Irish immigrant who went from rags to riches, shares his strategies for anyone who wants to achieve the American dream in this New York Times and Wall Street Journal bestseller. Brian Buffini embodies the classic rags to riches tale: born and raised in Dublin, Ireland, he arrived in San Diego, California at nineteen years old with just ninety-two dollars in his pocket. Since then he has become one of his new nation’s top real estate moguls and a founder of the largest business training company, Buffini & Co., in North America. And Brian isn’t alone in his circle of success: while immigrants compose thirteen percent of the American population, they are responsible for creating a quarter of all new businesses. So, what’s their secret? 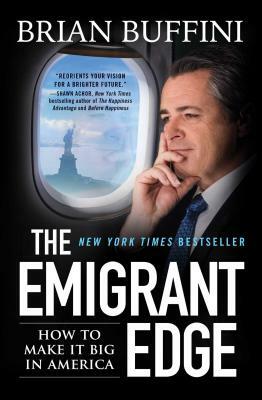 In The Emigrant Edge, Brian shares seven key characteristics that he and other successful immigrants have in common that can help produce a high level of achievement for anyone—no matter their vocation. He then challenges us to leave the comfort of our current work conditions to apply these secrets and achieve the success of our dreams. With a timely message sure to resonate with anyone who wants to prosper in the business world, The Emigrant Edge is a passionate, deeply personal story bound to inspire. Born and raised in Dublin, Ireland, Brian immigrated to San Diego, California, and he came to personify the classic American rags-to-riches story. He is one of the nation’s top business experts and founder of Buffini & Company—an organization dedicated to sharing his powerful lead-generation systems with others. Based in Carlsbad, California, Buffini & Company is the largest business coaching and training company in North America, and has trained three million business professionals in thirty-seven countries. Buffini & Company currently coaches more than ten thousand business people across North America. Today, Brian travels the world sharing a message of encouragement about how to “live the good life.” His wit, wisdom, and motivational style make him a dynamic speaker adept at helping people tap into their full potential and achieve their dreams. He is the author of the New York Times bestselling The Emigrant Edge.